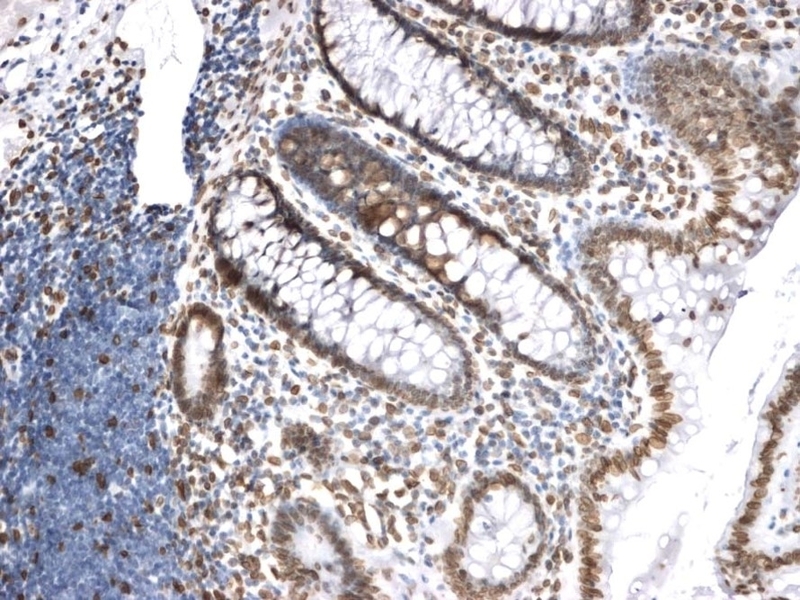 Paraffin section of human colon stained with Mouse anti Lamin A/C (MCA1429GA). Mouse anti Human lamin A/C, clone JOL2, recognizes both recombinant and native forms of human lamin A and C, nuclear intermediate filament proteins encoded by the same LMNA gene via alternative splicing. In addition to providing structural support to the nuclear envelope, these proteins contribute to chromatin organisation and the regulation of gene expression. Mutations in the LMNA gene are responsible for a broad spectrum of disorders, termed laminopathies, including Emery-Dreifuss muscular dystrophy and dilated cardiomyopathy. The JOL2 clone has been shown to bind to an epitope between amino acids 464-572. 1Mouse anti lamin A/C requires antigen retrieval using heat treatment prior to staining of paraffin sections. Citrate buffer pH 6.2 is recommended for this purpose. Tilgner, K. et al. (2009) Dynamic complexes of A-type lamins and emerin influence adipogenic capacity of the cell via nucleocytoplasmic distribution of beta-catenin. J Cell Sci. 122: 401-13. Ivorra, C. et al. (2006) A mechanism of AP-1 suppression through interaction of c-Fos with lamin A/C. Navarro, C.L. et al. (2004) Lamin A and ZMPSTE24 (FACE-1) defects cause nuclear disorganization and identify restrictive dermopathy as a lethal neonatal laminopathy. Hum Mol Genet. 13: 2493-503. Cummings, M. et al. (2006) XPA versus ERCC1 as chemosensitising agents to cisplatin and mitomycin C in prostate cancer cells: role of ERCC1 in homologous recombination repair. Markiewicz, E. et al. (2006) The inner nuclear membrane protein emerin regulates beta-catenin activity by restricting its accumulation in the nucleus. Zhang, Q. et al. (2007) Nesprin-1 and -2 are involved in the pathogenesis of Emery Dreifuss muscular dystrophy and are critical for nuclear envelope integrity. Hum Mol Genet. 16: 2816-33. Jean, D. et al. (2008) Cathepsin L expression is up-regulated by hypoxia in human melanoma cells: role of its 5'-untranslated region. Ndong, Jde. L. et al. (2009) Down-regulation of the expression of RB18A/MED1, a cofactor of transcription, triggers strong tumorigenic phenotype of human melanoma cells. Int J Cancer. 124: 2597-606.